After a Giro shamelessly made for Moser in 1977 (which Moser lost to Belgian upstart Michel Pollentier), the 1978 edition was designed to allow an-all-rounder win. Sunday, May 7: Prologue, St. Vincent 2 km individual time trial. Did not count towards GC. Vittorio or Pietro(?) Algeri s.t. Eric Van de Wiele s.t. The 1978 route was laid out in a 3,610.5-kilometer figure eight with an average stage length of 180 kilometers. Starting in Aosta, it crossed to the east, just north of the Arno and went only as far south as Ravello before turning north, taking seven stages to get to the Dolomites. With plenty of climbing and three individual time trials totaling 82.5 kilometers (not counting the prologue), a good all-rounder should triumph again in Milan. To avoid a conflict with soccer’s World Cup, the Giro start was moved up two weeks, running into the end of the Vuelta. Because of this, only the Teka squad represented Spain. Not a single French rider came to contest what the French saw as an Italian race jiggered to allow Italians to win (they should have asked Pollentier). The Belgians were the only other nationality represented in any number to break up the Italian party. Dietrich “Didi” Thurau won the two-kilometer prologue with Moser second at almost the same time. Since the prologue didn’t count towards the General Classification, it mattered only for show and to award a first Pink Jersey. It was stage three, ridden in Tuscany from La Spezia on the coast to Cascina, that may have decided the Giro. On the final climb, before the descent into Cascina, the contenders seemed to be content to mark each other. While Moser, Thurau, Giuseppe Saronni and the others were comfortable knowing that each had the other in sight, Johan de Muynck, now riding for Bianchi with Gimondi as gregario di lusso, motored off the front. Although de Muynck had placed second and nearly won the 1976 Giro, he didn’t seem to worry the others. De Muynck cruised across the finish line with a 52-second lead over the Moser-led pack. The slightly built Belgian was just barely able defend his lead the next day in a 25-kilometer time trial. Thurau was his usual superb self when it came to riding against the clock but he could only beat de Muynck by 44 seconds, leaving de Muynck in pink. After stage seven was finished rolling through the hills of Campania, the list of contenders was reduced by one. Thurau tried to escape early in the stage and ran out of gas. Completely. He finished 4 minutes 17 seconds after Giuseppe Saronni led in a twenty-man group that included de Vlaeminck, Moser, de Muynck, Baronchelli and Battaglin. Thurau’s quest for victory was over and after crashing in stage ten, he abandoned. Stage eight ended on the Sorrento Peninsula south of Naples and revealed a new dimension to Italy’s young wonder Giuseppe Saronni. On the climb to the finish line in Ravello, the 20-year-old racer attacked and got clear, showing that he was more than a sprinter. As the race headed north through Umbria, Tuscany, and Le Marche to Veneto for the start of the real climbing, Wladimiro Panizza, Baronchelli and Battaglin were able to move up in the classification while de Muynck steadfastly maintained his narrow lead. The riders were lashed by nasty snowy weather during their days in the Dolomites. Stage fifteen had the year’s Cima Coppi, the Passo Valles, where Baronchelli attacked with Moser and de Muynck on his wheel. There was some regroupment before the final climb, the San Pellegrino, where Moser cracked and lost over a minute to the lead trio of Baronchelli, Alfio Vandi and de Muynck. Though the tifosi had generously pushed Moser up the hill, the judges gave him only a nominal penalty of a few seconds. Baronchelli’s stage win moved him up to second in the Overall, but de Muynck remained as steady as a rock, holding on to what was now a 93-second lead. A 45-kilometer individual time trial at Cavalese, near Trent, over a highly technical course that included a hard climb, presented a serious danger to de Muynck. Moser, the hometown boy, won the day, beating de Muynck by 2 minutes 18 seconds. Baronchelli closed in as well. Still in the Dolomites, stage seventeen finished at the top of Monte Bondone. It was too much for Moser—probably still tired from his time trial effort—he lost about two and a half minutes. Panizza won the stage alone, but about a minute behind him, de Muynck finished with the rest of the good climbers and two seconds ahead of Baronchelli. Stage eighteen was the last day of climbing and things didn’t change, except the grudge between Moser and Baronchelli deteriorated into a fistfight. The grand old man of the peloton, Felice Gimondi, intervened. The organizers had tried to keep the racing challenging up until the penultimate stage, but bad weather and resignation kept the peloton from seriously contesting the minor climb into the city of Como. With de Muynck’s (pictured at right) unshakable racing combined with his powerful team’s ability to protect his lead, the others probably thought there was no point in attacking the capable Belgian. 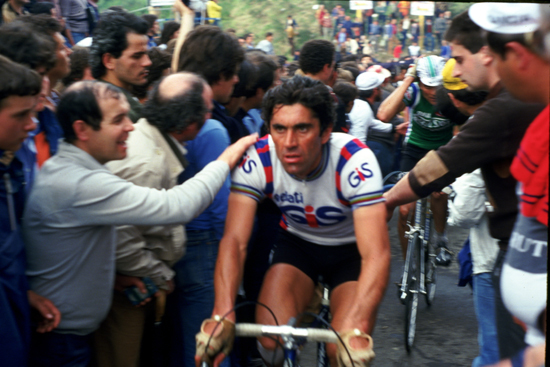 The 1978 Giro was his. For a second time Baronchelli had lost the Giro to a Belgian by less than a minute. 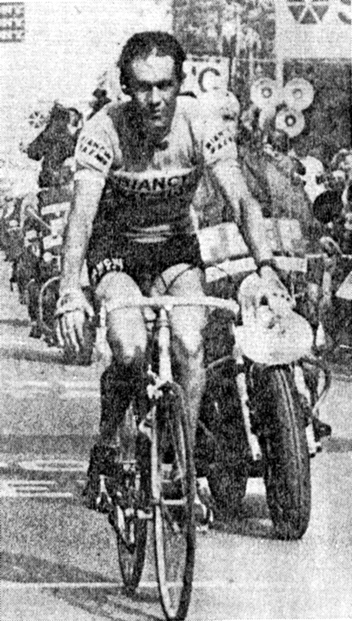 Baronchelli may not have won the Giro but he expressed satisfaction that he had at least come ahead of Moser, whom he detested. It was 118 kilometers into the Tour of Emilia on October 4 that Felice Gimondi and his good friend Franco Bitossi undid their toe straps together and climbed off their bikes. Bitossi remembered, “I was 38 years, 1 month, and 3 days old. 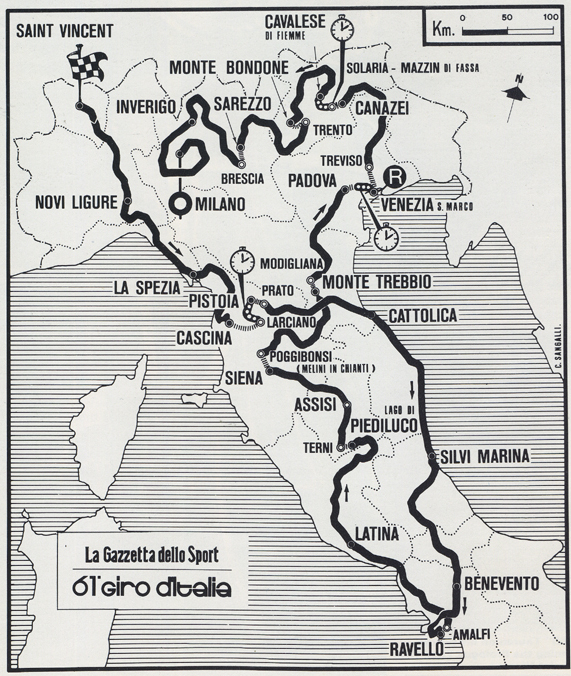 I started my career at the Tour of Emilia of 1961, the 4th of October and I finished my career at the Tour of Emilia of 1978, the 4th of October. After 17 years one has to know when to say, ‘Basta.’” The two of them ended their careers on the spot. Bitossi had won 147 races including the Tour’s Points Jersey and the Giro’s Climbers’ and Points Jerseys. Gimondi had won the Tour, the Giro, the Vuelta, the World Road Championship, Paris–Roubaix, Milan–San Remo and a host of other races totaling 135 professional victories. Both men could win almost any race on a given day and raced the whole professional calendar year after year. Theirs was a dying breed.